Students win two of the most challenging student instrumental competitions in Northeast Ohio: The Akron Youth Symphony Concerto Competition and the Cleveland Orchestra Youth Orchestra Concerto Competition. University School student Henry Shapard will be performing Kabalevsky’s Cello Concerto in G Minor with the Cleveland Orchestra Youth Orchestra (COYO) on Sunday, May 3. My job as a soloist is to make this rarely heard piece come to life and inspire audience members to go home and give it a second listen. Two of the most challenging student instrumental competitions in Northeast Ohio have one thing in common: they were both won by University School cellists. In January, Alex Cha, a junior, won the Akron Youth Symphony Concerto Competition. Henry Shapard, also a junior, won the 2014-15 Cleveland Orchestra Youth Orchestra Concerto Competition. The victories provided the opportunity for the two to showcase their talents on even bigger stages. Alex recently performed Edward Elgar's Cello Concerto in E Minor (first movement) at the Akron Civic Theater with the Akron Symphony Orchestra as part of the annual Link Up Concert. Henry will be performing Dmitri Kabalevsky’s Cello Concerto in G Minor with the Cleveland Orchestra Youth Orchestra (COYO) on Sunday, May 3, at 8:00 p.m.
Alex, a resident of Highland Heights, Ohio, is in his fifth year as a member of the Akron Youth Symphony and has served as principal cellist and performed in the chamber orchestra. He has been a cello student of Pamela Kelly at the Cleveland Institute of Music’s (CIM) Preparatory Department for over ten years. In 2012, Alex won the junior division of the Cleveland Cello Society Competition. He was first stand in the 2013-14 Northeast Ohio Regional Orchestra cello section and a member of the Ohio All-State Orchestra in early 2014. “Music will always be part of my life, and I am considering minoring in music in college even as I focus on other major academic areas,” said Alex. Henry is also in his fifth season as a member of the COYO and has served as both assistant principal and principal cello. A student of Richard Weiss in the Preparatory Department of CIM, he has played the cello since the age of three. He has won various competitions, including the Chinese Professional Entrepreneurial Organization string competition, and the Elementary, Junior, and Senior divisions of the Cleveland Cello Society Scholarship Competition. 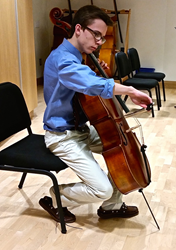 In the summer of 2014, he was one of six cellists selected from around the USA to participate in the Young Artists Program of the Yellow Barn Music Festival in Putney, Vermont. This summer, Alex will be continuing his cello studies and performing for various groups in the Cleveland-Akron area. Henry will be playing on two different concert tours in China. In June, he will be performing there as principal cellist with Cleveland Orchestra Youth Orchestra. In July, he will be performing at Carnegie Hall and in seven different Chinese cities as a member of the National Youth Orchestra of the United States of America. Tickets to the May 3rd concert are available directly through the Severance Hall Ticket Office at 216-231-1111, or online at clevelandorchestra.com. About University School: Founded in 1890, University School is an independent day school, educating boys in kindergarten through grade 12. The school’s mission is to inspire boys of promise to become young men of character who lead and serve. Our dedicated faculty, rigorous curriculum, and experiential programs foster intellectual, physical, creative, and moral excellence. University School is a diverse and inclusive community where each boy is known and loved. University School student Alex Cha recently Edward Elgar's Cello Concerto in E Minor with the Akron Symphony Orchestra.